Toys are incredibly crucial to the mental and physical health of your bird. But not much is written as to why they are so important. Instead, other important aspects of companion bird care are being studied. For instance, malnutrition has been named as one of the leading causes of fatalities in pet birds. So in the last decade or so, it has come to the forefront of articles being written about regarding companion birds. The all-seed diet isn’t dead yet, but it is slowly fading as people are coming to the realization that this practice will lead to very sick or deceased companion birds. It just isn’t healthy. Toys for your pet birds are just as important but obviously for different reasons. But toys do contribute to the mental and physical health of your bird. And people all over are starting to recognize the importance of toys for their companion birds. Leading authorities on companion birds are now addressing foraging and enrichment as very important aspects of companion bird care and they are writing about it. If you have a busy lifestyle that includes a family as well as a job, your birds are going to spend a significant amount of time on their own alone. What are they supposed to do with all of that time? You simply can’t be there for them every single minute. Boredom sets in and they may take it out on their feathers or just become listless. They have nothing to do without toys and it affects their state of mind. These are very intelligent creatures and they require stimulation and enrichment. Toys also provide more than just something to do. Interacting with a toy not only stimulates their minds, it keeps them active and engaged physically. Birds were made to be active and physically move around, not just sit on a perch all day. Birds in the wild are constantly on the move, flying, hopping from tree limb to rooftop, foraging for food and even playing. Yes, birds in the wild do indeed play. They play not only with objects but they interact with other birds as well. They also have other instincts that lead to play-like activities. Birds have a natural instinct to gnaw on wood as well as bark leaves and other objects. This instinct is what gives them the necessary urge to build nests and create nest hollows in trees as well as foraging for food. In the wild they have been observed flinging twigs around, stripping the bark off of twigs and tree limbs, bathing in puddles, hanging upside down and swinging as well as playing tag; all play activities. What toys do for birds in captivity is provide an outlet for these natural play activities. By interacting with their toys, they are acting on their natural urges to chew, to toss things around and to dig and scratch. It keeps them moving and stimulates their minds. Toys provide an outlet for them to remain active even while in their cages or on their play gyms. The chewing action helps keep their beaks in top condition and the physical interactions keep their muscles strong and in good condition. Birds are naturally active and they simply need this activity to stay in good shape. This use of their muscles and tendons provides exercise and activity that they naturally would get in the wild. Exercise also keeps their bones in shape as well as burning off calories. Just as a child gets exercise by being outside and running around playing, this play time with toys is important for their well being. Toys of different shapes and colors as well as a variety of textures provide interest, entertainment and give your companion bird a “job” so to speak. Does your bird ever get aggressive? Sometimes birds in breeding condition tend to get a little feisty due to excessive hormones racing around in their systems. This natural aggression needs to go somewhere so toys are an ideal and safe outlet for them to ket out their aggression so she doesn’t keep it pent up. Giving her this outlet may just lower that aggression. Most birds are naturally independent and enjoy making choices for themselves. 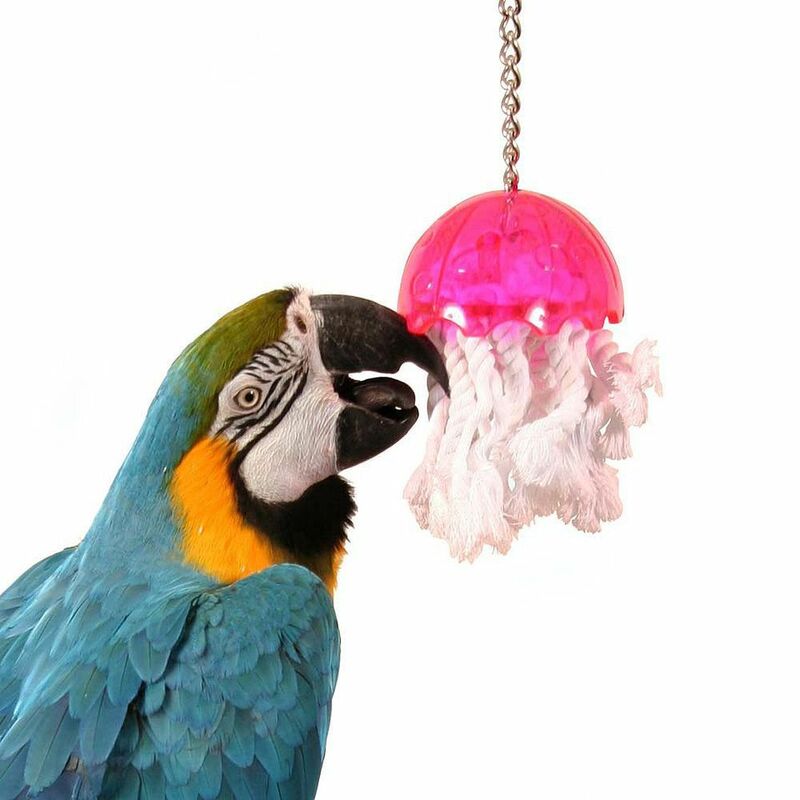 Toys not only keep your birds busy, they provide those choices and can instill confidence. A parrot can make decisions in her life such as what toy to play with and how to play with it. Toys don’t even need to be all that complicated. How many times have you seen a child playing for hours with nothing but a box? Amazingly, even the simplest of objects can inspire some very imaginative play. For instance, Alex from The Alex Foundation was not too fond of toys. But if you gave Alex a box, he would spend hours of time making holes in it, customizing it and turning it into nothing but a pile of rubble. My African Grey, Parker is much the same way. He does indeed enjoy toys but gives him a box and in a few days, there will be nothing left but a pile of chewed up cardboard. He is especially fond of playing with paper plates. Along with giving them toys to play with is ensuring you keep an eye on the condition of the toys. Toys are meant to be played with chewed on, thrown around and banged so it is only natural that toys get worn out. So being vigilant about frayed cords and material, cracked plastic or anything else that might injure your bird is all a part of keeping your bird safe. Hazardous or unsafe items should never be accessible to your bird. Toys should also be kept clean and fresh. This isn't always easy, but keep them as clean as you can. Purchasing toys from reputable suppliers can also go a long way in toy safety. You’ll want to only do business with toy suppliers who use bird-safe products. Vegetable-dyed toys and vegetable tanned leather are just two of the features you’ll want to look for when reading the description of the toy. And if you ever want to donate to a parrot adoption and education foundation, toys are a wonderful way to do it. Toys are incredibly important to the mental well-being of your companion birds. But ensuring those toys are safe is yet another aspect that bird families need to be aware of.